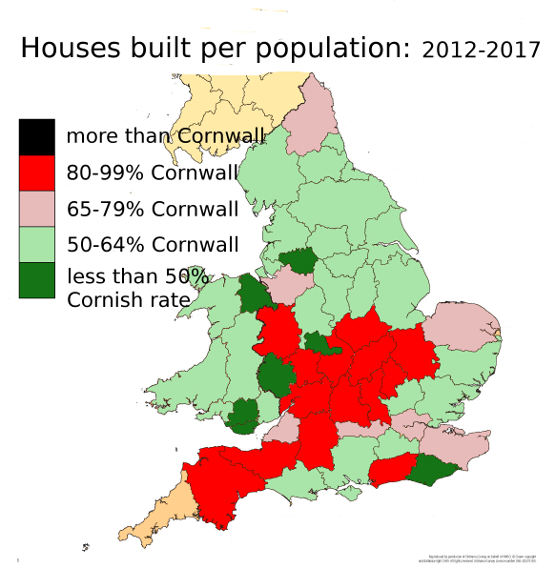 Cornwall Council’s housing target and ‘local demand’ | Cornwall – a developers' paradise? Having climbed the ladder to the dizzy heights of Chief Executive of one of the largest local authorities in the UK, Kate Kennally is, one assumes, an intelligent person. Which makes it all the more strange that a week or so back she trotted out the same tired old justification for the highest housebuilding target in Cornish history. The current target of 52,500 houses was required, she claimed, ‘in order to meet local demand’. Oh dear: whatever can we make of this? Does she and the Council’s leadership cabal really believe that local residents follow most councillors and readily swallow this guff about ‘local demand’? Or should we be more charitable and presume she was fed this by one of her planning officers, who have consistently peddled this line for years. Except that the number needed to meet ‘local demand’ seems to be slowly and inexorably rising. 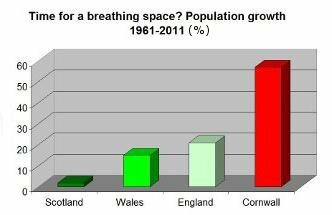 Cornwall’s population has been growing a lot faster than the rest of the UK for some time. So what exactly lies behind this constantly inflating ‘local demand’? For a start, not a little disingenuity lurks behind the simple phrase ‘local demand’. The person in the street would no doubt guess that this means demand that arises locally, from Cornish residents. For decades now, the demand for extra housing stemming from demographic change within Cornwall has been miniscule. Apart from just two years (2010-11 and 2011-12), when there was a small temporary excess of births over deaths, natural population change in Cornwall (births minus deaths) has been negative for decades. In other words, left to its own devices, the resident population would be shrinking – by around 700 people a year at the moment. Even allowing for a falling household size the demand arising from local, natural change could be met by building just a few thousand houses. But, as we know, the population is not falling. It’s rising. This is entirely due to an excess of in-migrants over out-migrants. ‘Local demand’ for planners doesn’t mean what it means to the rest of us. It means demand that originates elsewhere but is fulfilled in Cornwall. It’s ‘demand in Cornwall’ rather than ‘demand from Cornwall’. Since 2011 the Office of National Statistics (ONS) estimates that population growth in Cornwall has been running at around 4,000 a year. This is considerably higher than in the 2000s, when it averaged 3,380 a year, already unsustainably high as it meant expanding the urban footprint by something like the equivalent of two Truros every decade. There are 14 years left to the 2010-30 Plan so at the current rate we might expect the population to rise by another 56,000 by 2030 (or just over three Truros). Housing targets are supposed to be based on official projections of population and household change. The latest ONS population projection forecasts a rise of 3,900 a year to 2030 (or 54,600), which is pretty close to the current purported rate of growth. ‘Purported’ because in the 2000s the ONS overestimated Cornwall’s population growth by 13.6%. They may well be doing the same again, but for the purpose of this exercise I’ll give them the benefit of the doubt. Past projections of household and population growth in Cornwall have also consistently exaggerated growth, but we’ll ignore that for now as well. We need to translate this growth of people into a growth of houses. First, let’s look at the Local Plan. This has a current target of 52,500 houses. If we again ignore the years of the Plan that have already passed, this equates to 36,750 houses in the 14 years left. However, the Ministry of Housing, Communities and Local Government formula that the Tory Government is threatening to impose on local authorities will add 5,000 to this target. In addition, Cornwall Council, far from resisting this increasingly unsustainable rate, is boasting that it wants to hit a target of 3,000 a year (New Frontiers, p.42). (This is feasible as 3,074 dwellings were added to stock in the last year of available data 2016-17). Notice anything odd here? It seems that we’re building a house for every 1.33 people. That’s strange, as the household size in Cornwall is much higher, at 2.2 persons per house. Even on the projected unsustainable (and most probably inflated) population growth rate, that ought to equate to 25,500 houses over the next 14 years. Nothing like as many as the 42,000 the Council is now pushing for. So who are all these surplus (to demand) houses being built for? There are two possibilities. First, some of them will be bought as second homes or holiday lets. If we take these groups into account, the average number of permanent residents per house in Cornwall falls to 2.0. At that rate a population growth of 56,000 will require 28,000 houses. But this is still well below the 42,000 the Council wants to see built. Second, the Council’s planners will no doubt draw out of their hat extra housing required to meet a ‘backlog’ of insufficient supply that is wrongly supposed to be the reason for people seeking housing on the Council’s Homechoice Register (HCR). Yet again the Council is supremely disingenuous about this, giving the impression that all those on the HCR are homeless. As the Housing Register before 2017 was approaching 30,000 this would have accounted for a good chunk of the 18,500 houses over and above demand from in-migrants, second home buyers and tourism investors. Except that it doesn’t. Even the Council’s pet consultants concluded in 2014, when the HCR was 27,000, that the actual backlog of housing to meet the needs of those on the Register was 5,480 (Strategic Housing Market Needs Assessment). The last available figure for the number on the register – for 2017 – was 18,758. As there have been changes since then it’s now lower, although details of the current number have mysteriously disappeared from the Council’s website. The Council’s planners reckon yet another 1,000 houses are needed every year to meet the annually arising need for affordable houses (most of it from in-migrants). But it’s illogical to add this to a calculation already based on population growth, as that would be double counting. Providing the right proportion of ‘affordable’ housing is an issue of ensuring that housing of the right tenure is provided, not quantity. The 33,500 houses required is STILL 13,500 (or 32%) fewer than the Council/Government target. Even though our calculation here is based on ‘official’ projections which, if the evidence of the past is anything to go by, are likely to have exaggerated Cornwall’s growth rates. More realistic assumptions taking into account the forecasting errors of the past would no doubt generate a lower figure. We can now see why Kate Kennally’s assertion that 52,500 houses are needed to meet ‘local demand’ is ludicrous. The vast majority of the housing target accommodates demand from in-migrants, not local demand. Even after doing this and building to meet demand from second home owners and the tourist industry, the housing target, if met, will produce a surplus supply. Given the way Cornwall is marketed, those who believe this will result in price falls are living in cloud-cuckoo land. It will merely stimulate even more in-migration through speculative housing schemes. More worryingly, this will then ensure that the constantly inflated official projections become reality. Make no mistake about it. Cornwall Council is entirely complicit in a housing target that is excessive and irresponsible by any reasonable criteria. Now its leaders have decided to become developers themselves and are hell-bent on building over and above any reasonable target based on actual demand, both local and external. This is now a central strand in their increasingly desperate scrabbling around to boost their income at a time of falling central government grants. There are no signs that Cornwall Council’s leadership will rethink their plans, the consequences of which will be to boost unsustainable population growth, irrevocably transforming Cornwall’s environment, landscapes and culture. Indeed, quite the reverse. The Council has become a parasite, leeching off Cornwall, its host organism, to keep itself alive. It will blindly continue to do this until Cornwall has been thoroughly drained of both its distinctiveness and Cornishness, leaving behind a desiccated husk. This entry was posted in Cornwall Council;, Local Plan, official statistics, population growth. Bookmark the permalink. Been trying for 7 years ,to get planning on my own land to rebuild a cottage that has stood there since 1806 was abandoned in 1978,will Cornwall council let me !! !